Tomatoes begin ripening on the plant in midsummer. The plants continue to flower and produce new fruits until the first fall frost kills of the tomato. Frost often hits when green tomatoes are still maturing on the plant. Fortunately, these green tomatoes continue to ripen after picking if they are stored properly. Tomatoes must reach a green mature stage to ripen successfully after they are picked. Fruits that are firm and full sized continue to ripen after harvest. Small, hard tomatoes haven't developed enough to finish the ripening process. Pick the green fruits before the first frost damages the tomatoes. 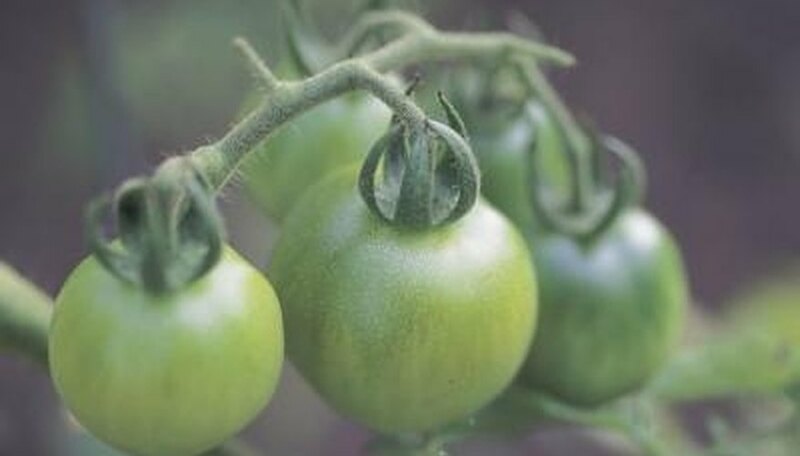 If most of the tomatoes on the plant have reached a green mature stage, pull up the entire plant for ripening indoors instead of picking individual fruits. Fully green tomatoes take longer to ripen after picking than those beginning to develop a red or orange blush. Separate the tomatoes by color. Store both red and green fruits in a shallow open box in a single or double layer until you are ready to fully ripen the tomatoes. Place the tomatoes with the stem end down if you are stacking them two layers deep to prevent bruising. Store green tomatoes in a 55- to 70-degree location and store those developing their red color in a 45- to 50-degree location. How quickly the tomatoes ripen varies, so check the stored fruits once every two to three days and remove any from storage that develop a full red color. Tomatoes ripen on pulled plants within seven to 10 days after picking if they are left attached to the plant. Hang the plant upside down in a cool, dark area, such as in a basement. The tomatoes that have already begun to develop a blush ripen first. Pull the tomatoes from the plant daily as they reach their full color. Discard the old plant once all the tomatoes have reach the full red stage of ripeness. Tomatoes picked individually ripen best at room temperature, or approximately 70 F. It takes the tomato approximately 14 days to reach the full ripe stage if it is picked when fully green. Keep the tomatoes in a box or paper bag on the counter but away from direct sunlight during the ripening period. Remove fully ripe tomatoes from the box daily for immediate use until all the tomatoes have reached full maturity. Slow ripening by keeping the tomatoes in a 55 F location. Tomatoes ripened at this lower temperature take approximately a month to reach full maturity.